In Cameroon and Congo, men’s fashion is a serious business. 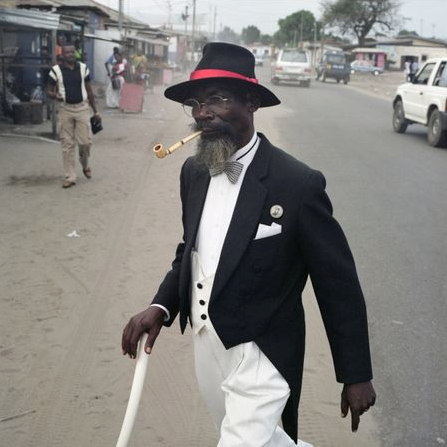 Since the late 1990s, a fashion phenomenon of dandyism, or La Sape, has swept these African nations. It can be seen everywhere, from bustling markets to hectic city centres being worn by both rich and poor; the unique La Sape style combines vivid colours, perfectly tailored suits and eye-catching accessories. Now, these always immaculately turned-out dandies are making waves across the continents and the chic Sapeur style is set to become a must for men everywhere. From Paris Fashion Week to the runways of New York, traditional African styles and wax print fabrics are making a huge impact. Solange Knowles brought a lot of attention to the style with the video for her 2012 hit single Losing You (below), which was shot in South Africa. As well as this, glossy fashion magazines such as Vogue and Harper’s Bazaar have modelled elegant photo shoots on this unique Congolese style, dressing models in brightly coloured Yves Saint Laurent suits, dapper Ozwald Boateng jackets and slick Grenson shoes. However, you don’t need a celebrity stylist or access to a designer wardrobe in order to pull off this one of a kind style. La Sape style is the ultimate meeting of cultures. Traditional West African wax prints and bold colours come together with the fitted, tailored trousers, double-breasted jackets and the smart shirts and ties of typical ‘English gentleman’ fashion. Pink, yellow and blue are the most commonly seen colours on the streets of Cameroon and Congo. A great way to recreate the look is to team a smart pair of trousers and matching jacket in one of these show-stopping hues with a tie or shirt made from the traditional pagne patterned wax printed cloth of the Congo. Accessories are all the rage in West Africa’s fashion elite, so make sure to spruce up the outfit with a pair of bold cuff-links, some stylish sunglasses or some dazzling jewellery to really embody the spirit of La Sape. Throw on a chic pair of brogues to truly complete the outfit and you’ll have the style down perfectly; Like a Sir! ← What are Super Wax Prints?